The next meeting of the Supporters` Council will be on Thursday 14 May at 7pm in the Kingdom Suite, which has disabled access. A 4th year student currently undertaking a dissertation at the University of Stirling is currently doing a thesis and wants the help of Pars fans, the focus of research is on fans perspectives of fan ownership. 27th January 2014 sees the launch of the Pars Wash Pars Wash is located at the rear of the north stand – take the road between the ground and the garage up to the car park at rear of stand. 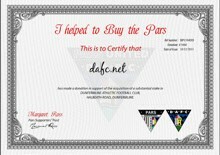 1885 Worldwide is a new internet-based fans’ organisation, open to absolutely everyone, but designed specifically to help Dunfermline Athletic go global, establishing links all over the UK and the world by appealing to existing expatriate fans and any potentially new fans who might be interested in adopting the Pars as their second or Scottish club. Pars Fans have been fantastic over recent months with auctions and donations. A donation of £5,000 was handed over to the PST by Kenny Mclachlan on the day that Pars United were awarded Preferred Bidder status. Further donations of £10,000 wer made on 11th December 2013 and a further 2 certificates were received. On Sunday 14th April 2013 there will be a Charity Football Match at East End Park, Dunfermline with all funds raised going to CHAS, Aberlour Childrens Charity, Tartan Army Childrens Charity, Clic Sergent, Homestart and DAFC Community Programme. 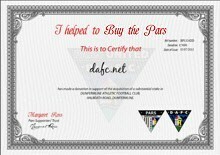 Big Hearted Pars Fans Help others to follow their team. A loyal band of expats continue the community spirit at Dunfermline Athletic by buying season tickets for deserving Pars fans who would otherwise not be able to attend games.